Most of time when you search for CNTK's example, they are training and evaluating model using bulk data, but in some production field, we need evaluate one or few image from real time generated data, how does CNTK framework work on it? Let's find out. 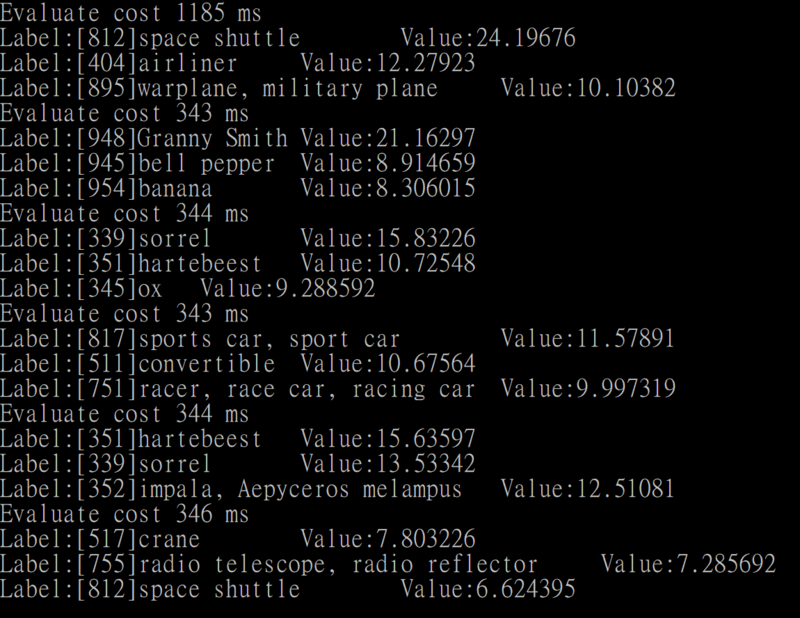 I writed some example for compare evaluate performance between from C#/CNTK, Python/CNTK and Python/OpenCv+DNN, full solution put on github CNTK Evaluate Performance Test with detail description, so I will skip the code detail focus on others. 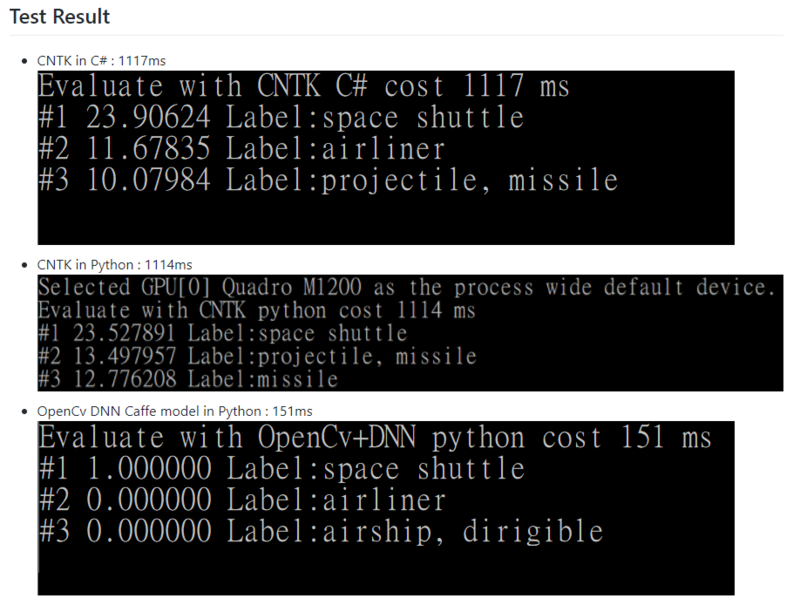 Let's check the performance test result first, CNTK framework(both C# and Python) need over 1100ms to evaluate one image, but OpenCv+DNN only need 150ms to do same thing on same pc. This result was weird, so I post new issue on CNTK, thank for the help of CNTK team, I know how to solve the program in few days. 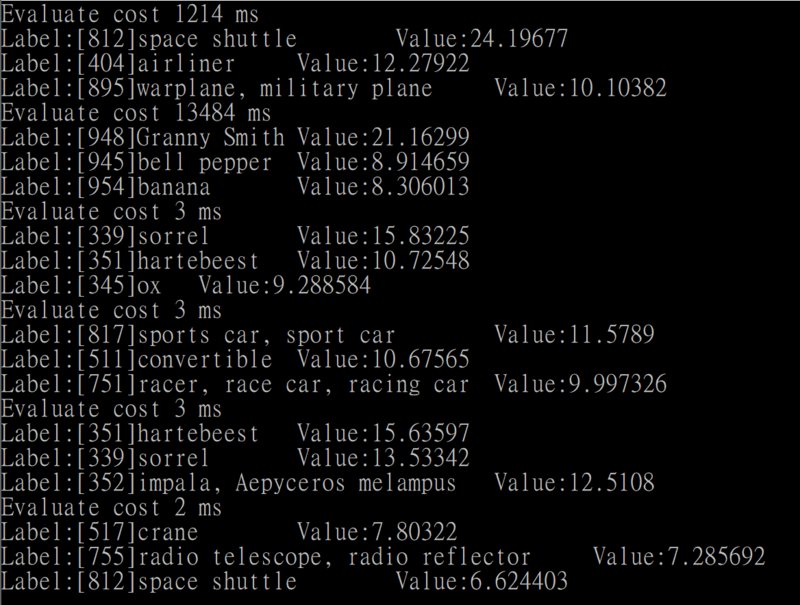 At first,CNTK team recommend me try multiple evaluations and see if it gets faster, the result was here. First test was same, second test extremely slow, but the rest was extremely fast. CNTK team explain how and why the result performance like that. In CNTK we have autotuning for determining which convolution to be used during execution. This happens in the second minibatch. Autotuning consumes extra memory, thus in the first minibatch we use zero/low memory convolution methods to make sure data buffers are allocated first. Then during the second minibatch we perform autotuning to find the fastest algorithm. Starting the third minibatch things will run very fast. You may consider feeding some dummy data with same dimension as your input, and treat first two minibatches as model initialization. Overall, if we need using CNTK to evaluate things in real time, we need to add two dummy minibatch to warm up it, then the evaluation can run very fast. BTW，if your system don't need VERY fast evaluation, you can try using CPU as device, on my environment it look like can avoid autotuning extra time, although the evaluate speed not so fast but maybe it can fit your need.